We are proud to announce the new club promotion that will enable you to get all Templatic themes for just $199. The promotion starts today (October 7th) and lasts a full week (until October 15th 2011). 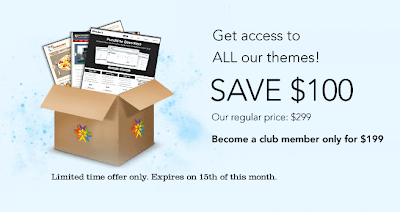 If you’re unfamiliar with our Club package make sure you visit our Club page To check out the sweet themes you’ll have access to when you become a member be sure to visit our Theme Store. Become a member now and get all Templatic themes for just $199! No coupon code required. Other than just themes, Templatic club members also have access to beta releases. That’s right, become a member now and be among first to get your hands on the new version of the Geo Places theme when it becomes available. Want to become a member but can’t afford it? Help us spread the word about this promotion and get a chance the win one club membership totally free! To participate in the contest click either on the tweet button to post the news on Twitter or the Like/Share link to share or like the news on Facebook. The contest ends on the last day of the promotion (October 15th).